There are quite a few big changes with 0.25 with the inclusion of the new career mode. The downside to having to watch my budget is trying to make my rockets economical as there have been a couple of occasions where my main rocket/ lander combo costs more than the money I make on the mission. From that I started looking into creating a few SSTO (single stage to orbit or spaceplane if you will) as a more economical option. The main difference between a rocket and an SSTO is that a true SSTO is designed to not shed any parts as it ascends and returns making it reusable and thus cheaper because we all like having more currency (fictional or otherwise) to play with. I have ended up cheating slightly by creating a new sandbox game so I don’t have to worry about becoming bankrupt with all my test planes. 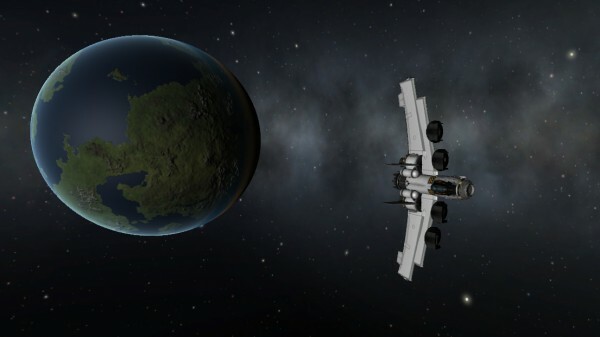 After a number of attempts I managed to make a very small SSTO that could touch space and come down to land with what little fuel it was carrying with a really helpful guide by the You-tuber Scott Manley. After playing around with the designs and a number of catastrophic crashes I managed to get my space plane into a stable orbit over Kerbin and return safely to the runway! I even managed to top it off by modifying it to enable it to perform vertical take offs like the famous Harrier jets. I attempted to create a larger space plane though it struggled to get off the runway and went belly up in the ocean. It looks like fuel/ weight was always going to be one of the largest issues and it is looking more plausible to use the planes to create either a large interplanetary vessel or fuelling station to travel further out. I had to do a bit of reading up on this point as the idea of getting a large vessel into space would be a difficult task as you burn through more weight getting it into space. I had a go moving a small station into space but it struggled to get off the landing pad. 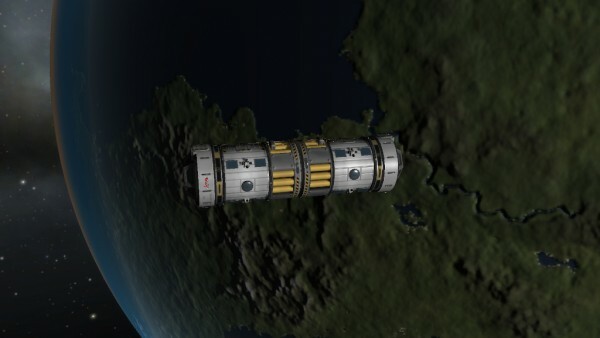 The other option was to build a modular station and lift it into orbit bit by bit connecting it together as i go along. There are several different sized docking ports in Kerbal which allow you to connect together ships to allow them to behave as one. I set up my first command module and rocket sending it up using the medium sized docking modules with a few tons of rocket fuel sat underneath it. I got to about 20000m from the surface and it started to flex like a straw. The ship started flailing around like a giant nunchucks before it attempted to attack the ground with such fury that my poor astronaut was flung with his command module into the floor. It was time to re-assess it’s structural integrity haha. I then attempted a similar ship but structured the lifter to be in front of my cargo so it would pull rather than push and added three docking ports in a triangle formation to make the ship connection more rigid. Everything went well and as managed to get into a stable orbit so I sent the same craft up again to attempt my first docking procedure! Thankfully I have done a few orbital rescues so I’m pretty comfortable with the actual rendezvous procedure. After spending about an hour matching orbital paths and velocities my second lifter got within 1km before I detached my second module and prepared to close in. I engaged my RCS thrusters and began to accelerate towards the first command module. Foolishly I didn’t think to account for the relative velocity and flew past my target and spent another half an hour trying to close the distance again. By some stroke of luck it went smoothly though I noticed that two of the docking ports had broken away from the first section rendering it pretty useless. It was time I rebuilt the test command modules and lifters again based on what I had learnt and prepared to launch. I managed to get both modules into space and within 2km of one another again sending the lifter into a slow descent with the parachutes staged and ready for a safe return. Closing the gap slowly, learning from the previous attempts slowed my relative velocity to 1m/s as I got within 50m. Slowing down I rotated both crafts so the docking ports were facing one another trying to creep closer to find the ships kept rotating slightly knocking them out of alignment. At this point I attempted to strafe around into position only to find between my camera angle and the fact I had unwittingly put my rcs thrusters at a weird angle around the main core. I only found it out when i tried to strafe right and it went off at an angle haha! Eventually I managed to get the two ships in the right position and managed to lock the two together! So after extensive testing I’m ready to get back into career mode and carry on with my adventures in Kerbal Space Program!